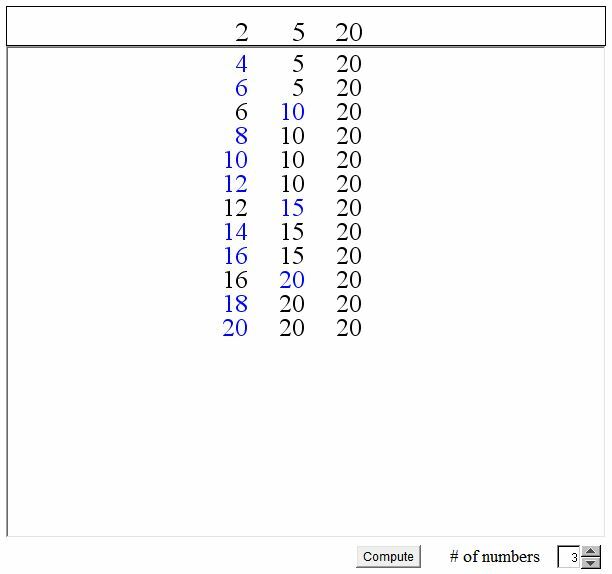 The applet below illustrates an algorithm for finding the Least Common Multiple (LCM) of a number of integers. xk0(m+1) = xk0(m) + xk0. In other words, the least element is increased by the corresponding x whereas the rest of the elements pass from X(m) to X(m+1) unchanged. The algorithm stops when all elements in sequence X(m) are equal. Their common value L is exactly LCM(X). If you are reading this, your browser is not set to run Java applets. Try IE11 or Safari and declare the site https:///www.cut-the-knot.org as trusted in the Java setup. Let Mk = max xi(k). There are only finitely many k such that Mk ≤ L. Let m be the largest such index. I.e., we assume that Mm ≤ L whereas Mm+1 > L provided the algorithm does not stop at step m. This assumption leads to a contradiction. r·x1 < L < (r+1)·x1. X(m) = (Mm, Mm, ..., Mm). This algorithm could be used to simulate a multitasking environment. In fact it was so used in the early days of computing. Assume, for example, you write a program which shows several balls bouncing up and down and off the walls. A task is associated with each ball that regularly updates its position and velocity. All balls must be continuously controlled, i.e. all the associated tasks need to be executed on a rotating basis. In addition, some balls may have to be updated more frequently than others. The solution is this: each task k is assigned the (reversed) relative frequency xk and the LCM algorithm is run. One step of task k is executed whenever xk(m) is updated. The above discussion shows that all tasks will be updated with the required frequencies. It's not hard to imagine why the algorithm is thought to resemble a patch of growing onions which are cut individually when they reach a prescribed height. Indeed in networking there is an important Onion Routing algorithm. In computational geometry, a similar idea led to the Onion Peeling Algorithm. A. J. Goldman; N. J. Fine, El655, The American Mathematical Monthly, Vol. 71, No. 9. (Nov., 1964), pp. 1045-1046.